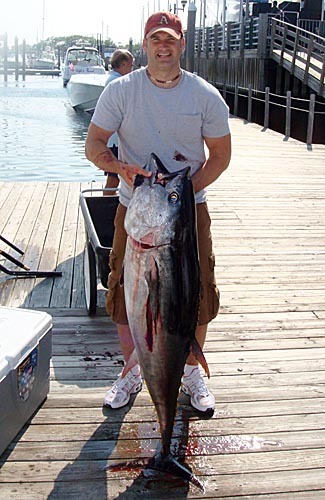 The 130 pound Bluefin Tuna that was an experience of a lifetime! ARCHIVE ENTRY – THIS POST ADDED 10/4/14. Back in 2008, a few weeks before I was getting married, my brother arranged a trip to Atlantic City, NJ that would end up being one of the most memorable weeks of my life. The high point was catching the largest fish of my life, on a charter that he arranged. Below is the story that chronicles the details of the catch, and even a condensed video from the hook up to the photos at the dock. All I can say, is a big thank you to my brother for making my dream of catching Bluefin Tuna, a reality. Weather started pretty bad with a storm that seemed to want to follow the boat. Eventually, we managed to get clear of it and started fishing about 35 miles off the coast. About an hour in, we got hooked up on a big fish. I have never seen such controlled chaos and excitement! As I positioned myself in the chair I was preparing for what I knew would be a challenge but had no idea just how big of a challenge it would be! The fight itself began really easy at first… (fish is swimming along with us). The line was coming in very easy and I either caught it up to the reel or it made a run – all I know is when I suddenly ‘felt’ the fish it felt like we had snagged into a submarine. I never felt something so strong in my life. Of course the fish hit on the line that was out 300 yards and I have to admit I was exhausted after the first 5 minutes. Little did I know I would be going on adrenaline for another 28 minutes. The fish made 2 major runs and it was nothing short of painful getting it back in each time. My forearms were burning bad and every muscle in my body was cursing me. The site of the leader was a thing of beauty, unfortunately I would see it come and go a few times. The crew & my brother kept shouting encouraging comments to keep me going… several times I wondered if I truly had it in me to get this fish in. I never once in my life dreamed I could encounter a fish that physically challenged me like this. I did in fact stick with it, and the fish never really gave up either. I would say it was more of just reeling like crazy until my heart felt like it was going to pound right out of my chest and then controlling the fish enough when it was close to the boat to allow the crew to try to gaff it. After a few failed attempts with the still spirited fish, the first mate Ed was able to get the gaff secure into it. He and another crew member Gene, as well as my brother, then combined to pull it up into the boat. I can’t even begin to say how relieved I was to actually see the fish securely in the boat! Throughout the fight my mind was preparing myself that we would lose the fish and I was thrilled that wasn’t the outcome! As I stared at the monster fish, I was pretty much still in shock. The ‘high fives’ were exchanged and I recall asking if anyone actually hit my hand as I couldn’t feel it. It was hilarious to have my arm completely numb from the elbow down. The fish was too large for the regular coolers mounted on the sides of the boat which meant it earned a place in the tank under the fishing platform that runs the length of the transom. I opened the door several times just to look at it, simply fascinated by it’s size. All smiles on the dock at Trump Casino! When we finally made it back to the dock at Trump Casino, a band was playing and a decent crowd was assembled on the patio adjacent to the boats. When the fish emerged from the boat and I began my photo session, we stole the show. 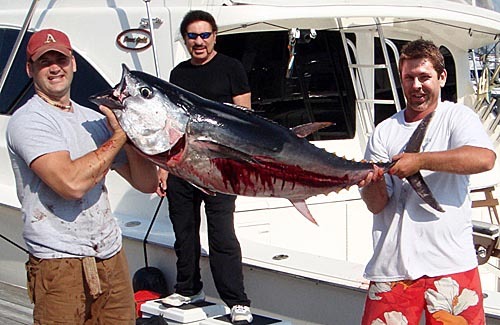 It was my few moments of fishing fame and being the rock star – all rolled into one. As if it wasn’t cool enough to make this lifetime fishing memory and accomplishment with my brother right there, I also got to share in the excitement with a crowd that just added more energy to the amazing overall experience. I remember tons of people asking me about the catch and being offered many free beers. I couldn’t have scripted a better day… well other than if my brother who let me get the first hookup… could have gotten a hookup as well.